On the latest push lower in the precious metals miners this month, the junior gold miners in the GDXJ ETF (daily chart, below) actually lagged the senior miners in the GDX ETF. Typically, that is a bearish sign of "risk off" in the complex, with the presumption of another leg lower in the space imminent. However, precious metals miners have responded favorably thus far to Chair Yellen's patience this week, with their rallies in past two sessions being overshadowed by the snapback bounces in the major indices. In addition, despite lagging the seniors we have a bullish RSI divergence to price in the juniors on those recent lows. For reference, the RSI is simply the "Relative Strength Index" used to identify changes in technical momentum. Above 50 is generally considered a bullish RSI, with above 70 viewed as overbought. Trending below 50 is considered a bearish RSI pattern, with below 30 considered oversold. Here, the RSI (seen on the top pane of the GDXJ daily chart, below) was positively diverging from price off those lows. And, more importantly, price is beginning to confirm the divergence in favor of the bulls. It will be interesting to see if gold bugs can finally make their stand down here. 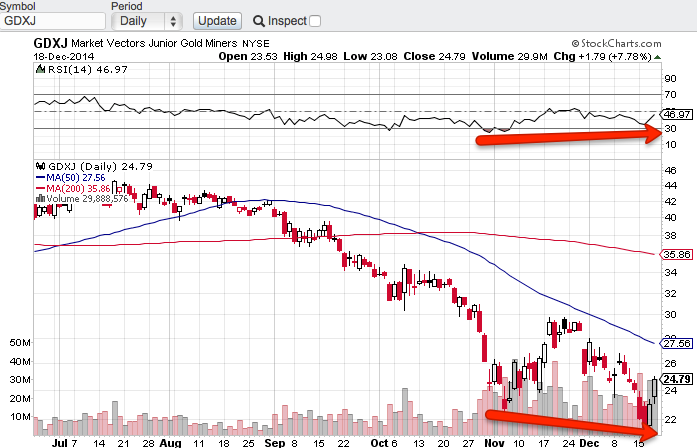 $20.40 on the GDX ETF, and $28 on GDXJ are some initial upside breakout triggers. For now, miners are outperforming metals after the FOMC and the rally in miners has been under-the-radar, which may very well be the best news gold bugs have had in a good while.